Your donation has been added. Serve with Samaritan’s Purse as an Operation Christmas Child seasonal employee and you will work side-by-side with thousands of volunteers to help bring Jesus’ love to children around the world. When you work in one of our eight processing centers, you help facilitate the processing and preparing of millions of shoeboxes for distribution to children in need. You are acting as the hands and feet of Jesus Christ to bring joy to children, families, and communities. The third week in November, we collect shoeboxes filled with school supplies, toys, and hygiene items packed by individuals and groups across the nation. From approximately mid-November to mid-December, we prepare these shoebox gifts for international shipment to church partners, who distribute these gifts to children during Gospel-focused community events. How Can I Work in a Processing Center? Click each role for more information. Our managers oversee areas such as quality control, shipping/receiving, and volunteer training. A processing center assistant is responsible for tasks such as coordinating with vendors, locating housing options for volunteers, receiving supplies shipped to the processing center, and helping close down the center after processing season. Chaplains provide spiritual support, prayer, and encouragement to processing center staff and volunteers. These assistants perform various administrative duties including tracking data, handling requests for promotional material, and mailing correspondence. They also work closely with volunteers in areas such as registration and scheduling. These associate positions include roles such as forklift operators, switch drivers, yard attendants, dock/warehouse workers, parking attendants, inventory, maintenance, quality control, greeters, and volunteer guides. One of our most crucial needs is for team coaches. A team coach should have supervisory and leadership experience as they will lead teams in the processing centers in a variety of tasks. Data entry keyers process scanned information and help to maintain donor records. Cash processors sort cash and coin donations. Mail processors sort checks via an eight-point checklist and categorize additional information from the envelope contents. Mail and data leads direct workflow and assist with questions from associates. "It’s way more than packing boxes. We prayed over each box and for the child who would receive the box. We wanted every shoebox to show a child that someone cares about them"
It is important for the employees to select Santa Ana as the branch they are applying at. We also request that the employees contact our office once they complete the first part of the application so that we can set up a time for them to come to our office. The phone number is (714) 543-1988. Processing center jobs are available mid-November to mid-December. A limited number of positions could require a different commitment (see individual job listings). Our active recruiting period is July-December. Applications are accepted all year, but will be held for consideration until the active recruiting period begins in July. 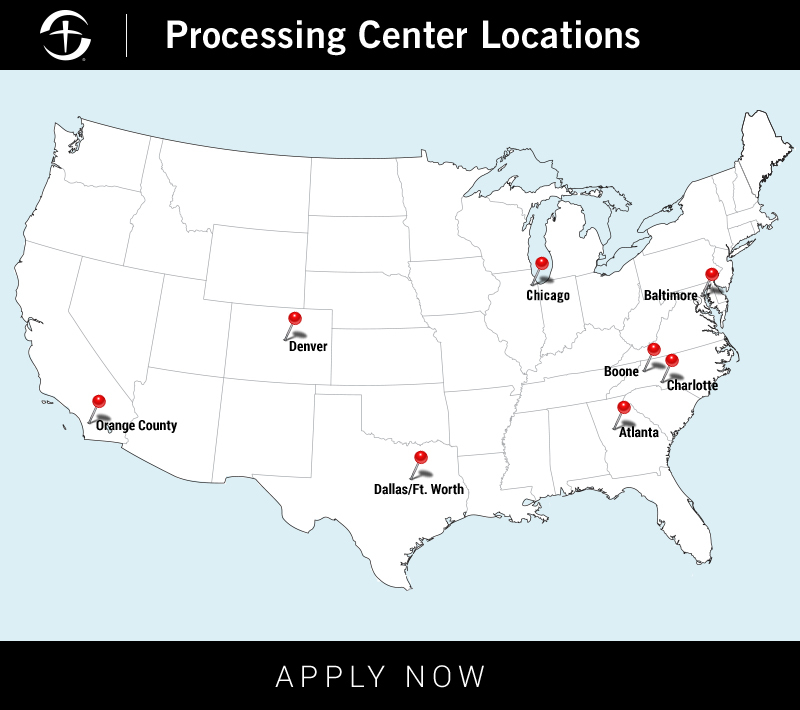 Positions are available at each of the processing center locations: Charlotte, NC; Boone, NC; Atlanta, GA; Baltimore, MD; Denver, CO; Dallas/Fort Worth TX; Minneapolis, MN; Orange County, CA. The Charlotte, Boone and Fullerton processing centers are permanent and stationary. Processing centers will always be located in the other areas, but the physical building location can vary from year to year. What can I expect as a seasonal employee? Candidates with any background or experience level are welcome to apply. Depending on the hiring needs, the most qualified applicants will be placed in the open positions where they can best contribute with their individual skill set. Since a lot of work must be accomplished in a fixed amount of time, applicants must be able to work full-time, 40+ hours per week including Saturdays, and be available to commit to the entire duration of the project. Consistent, punctual attendance is required, and a spirit of flexibility to work where you are most needed. A criminal background check and a social media check are required for every considered applicant. A current pastor’s reference and one professional reference are also required. All applications received will be reviewed, but because of the volume of applicants, only those qualified for open positions will be contacted to move forward in the process. © Copyright 2018 Samaritan’s Purse. All rights reserved. Samaritan’s Purse is a 501(c)(3) tax-exempt charity. All contributions designated for specific projects shall be applied to those projects, and we may assess up to 10 percent to be used for administering the gift. Occasionally, we receive more contributions for a given project than can be wisely applied to that project. When that happens, we use these funds to meet a similar pressing need. Sign up to receive email updates on the work of Samaritan’s Purse, prayer alerts, and volunteer opportunities.